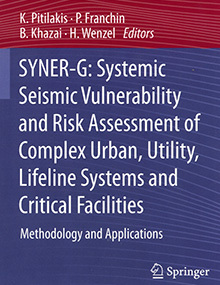 SYNER-G ist ein Forschungsprojekt mit dem Fokus auf systemischer seismischer Gefährdung und Risikoanalysen von Gebäuden, Lifelines und Infrastrukturen. 2014 wurde ein Buch über die Ergebnisse des Forschungsprojekts SYVER-G veröffentlicht und stellt einen bedeutenden Fortschritt im Bereich Erbebenvulnerabilität und Risikoanalyse komplexer, interagierender städtischer und regionaler Systeme und Infrastrukturen dar. 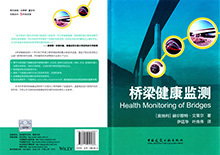 Seit Ende März gibt es auch eine chinesische Version des erfolgreichen Buches "Health Monitoring of Bridges" von Prof. Helmut Wenzel. 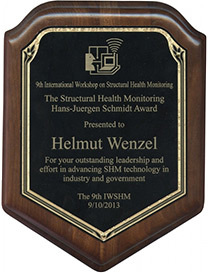 Congratulation to ISHMII Council member Dr. Helmut Wenzel, Vienna Consulting Engineers, who was honored at the 9th Annual International Workshop on Structural Health Monitoring at Stanford University, California, in September 2013. 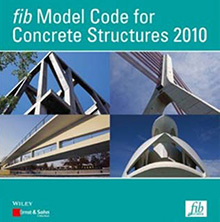 On 24 and 25 October 2013 a seminar on the fib Model Code 2010 takes place in Vienna with a focus on fibre-reinforced concrete, shear force and punching, durability, properties of composite concrete, numeric analyses as well as several other applications. The seminar addresses practical engineers, surveyors and architects, representatives of authorities and testing laboratories, cement and concrete manufacturers as well as graduates and students of the respective fields. All presentations are held in English. VCE acts as a sponsor of the seminar. Dr. Helmut Wenzel received this unique award which was created to honour and recognize persons especially from industry or government organizations for their continuing efforts and successful contributions to the field of Structural Health Monitoring and for his outstanding leadership in advancing SHM technologies in industry and government. From 28 to 30 August the VEESD2013 (Vienna Congress on Recent Advances in Earthquake Engineering and Structural Dynamics) took place at the Vienna University of Technology. The 13th D-A-CH Conference, which was held in German, was integrated in the congress. All in all 330 persons from 36 nations particpated. The congress was co-organized by VCE. From 6 to 8 May the International IABSE Conference 2013 took place in Rotterdam focussing on the topic "Assessment, Upgrading and Refurbishment of Infrastructures". On Saturday, 01 December 2012, an art gala organized by the district management of the 3rd district took place in Bucharest on the occasion of the national holiday. In the scope of this gala several persons from the fields of art and music were decorated. VCE Romania had designed the music and art school in the 3rd district where the gala took place and was awarded a diploma for extraordinary merits in architecture. The Minister Schultz van Haegen (Infrastructure and Environment) today announced the official start of work. "With the approach of the A15, we make the region stronger and more accessible. This is more than a highway project. We will build our infrastructure, both road and rail and water, to better utilise," she said. After 18 months of construction the rehabilitation measures at the Gazela Bridge in Belgrade over the Sava were concluded so that the bridge could be completely and officially opened to traffic, attended by numerous representatives of the Serbian Parliament, of the city of Belgrade and the Serbian motorway association PE Roads of Serbia as well as of the media. The bridge was opened to traffic earlier than planned due to the efforts of all parties involved, which can be seen as a result of the excellent cooperation. On Thursday, 24 November 2011 the jubilee celebration on the occasion of the 5th anniversary of the company VCE – Vienna Consulting Engineers S.R.L. took place in Bucharest. Among others MMag. Edith Predorf, a representative of the Austrian Federal Economic Chamber, as well as Ambassador Dr. Michael Schwarzinger from the Ministry of Foreign Affairs participated in the celebration. Engineering office in Vienna has designed the 130 m high pylons on both sides of the valley which have to carry the cables for the two cranes capable of carrying a load of 20 tons each. On 14 April 2011 the completion of the new Beska Bridge in Serbia over the Danube was celebrated. The new structure has a total length of 2200 m, the main span, whose completion was the occasion of the ceremony, amounts to 210 m. It is planned to open the bridge to traffic in September. In the Lainzer Tunnel the first track was completed, thus the 12.3 km long tube (link between western, southern and Donaulände railway line) is continuously accessible for the first time. The dynamic function of floating track slabs as well as a complete check method by measurements and analyses are demonstrated on the basis of theoretical considerations and practical measurements of wave propagation, which presents a decisive progress compared to selective checks performed so far. On Monday, 24 January 2011, the public viva voce in the post-doctoral lecture qualification procedure of Dr. Fritz Kopf took place at Vienna's Technical University in form of a dissertation with subsequent discussion. The commission composed of professors, assistant professors and students, supported by external foreign experts, decided positively, issued the "venia docendi", i.e. the authorization to teach at universities, for the field of soil mechanics and allocated the new lecturer to the Institute for Geotechnics (Prof. Tenschert, Prof. D. Adam). The cumulative professorial dissertation with the title "Bodendynamik – Theoretische und experimentelle Untersuchungen" (Soil mechanics – Theoretical and experimental investigations) comprises four technical papers dealing with dynamic soil compaction and its inspection. The dissertation on the occasion of the viva voce, however, also included topics from the current research activities at the companies VCE and FCP and was rated very positively. "I was not aware that research on such a high level is possible in the private sector", was a compliment that may please the whole company. A total of 210 million € were invested into maintenance and technical upgrade of the Arlberg railway tunnel in the last six years. Since Friday the trains have been travelling on two tracks through the ten kilometre long tunnel tube between the railway stations St. Anton (Tyrol) and Langen (Vorarlberg) again. Since 2004 the Arlberg railway tunnel has been extensively repaired at the tunnel floor and vault, a ballast-less track was installed, eight escape and emergency route connections were constructed in collaboration with Asfinag as well as lighting and a permanent water supply line for fire protection was installed.